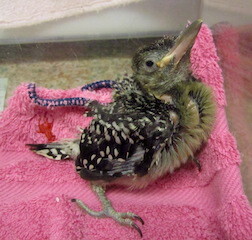 Three hatchling red-bellied woodpeckers were admitted from Captiva after their nest was destroyed during construction. They are only a few days old and have not even opened their eyes. They have voracious appetites and require feedings every 45 minutes throughout the day. 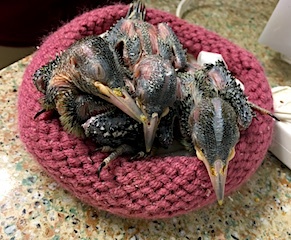 As they grow, they will be taught how to eat on their own and eventually how to fly before being able to be released. 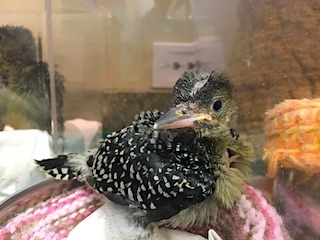 After 5 days in the clinic, the baby woodpeckers have began to open their eyes. They receive hourly feedings, as many as 12 times throughout the day! After the weekend, two of the three woodpeckers have fully opened their eyes. They continue to receive feedings of an insectivore slurry using a syringe approximately every hour. 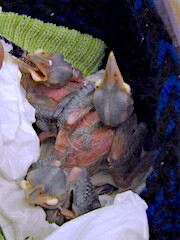 Many of their feathers have began to grow. Upon re-evaluation, it was determined these are red-bellied woodpeckers, not pileated woodpeckers. They were originally thought to be pileated based on their size at intake. Once their feathers began to further develop, the veterinarians were able to determine the correct species. The little woodpeckers continue to grow and remain bright and alert. At intake, they averaged just 39 grams. They now all weigh over 50 grams! The three woodpeckers have grown significantly and are now being transitioned from being fed a slurry of insectivore diet onto solid food including mealworms and woodpecker diet. They have grown their first-year plumage and will develop the distinctive red head once they molt into their adult plumage later in life. 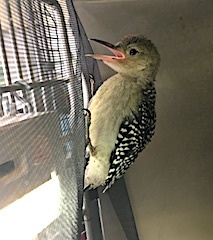 The fledging woodpeckers were moved outside to a larger enclosure where they will be able to practice and perfect their flying skills. Once they have mastered this skill they will be ready for release. 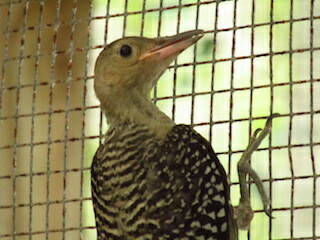 The red-bellied woodpeckers were released over the weekend in Fort Myers, Florida.